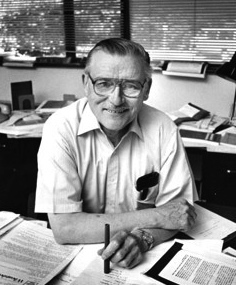 Although I have known of James M. Buchanan all of my academic career, I got to known him at a personal level as a colleague and a friend in 2000. Looking back, our first meeting established the nature of our relationship since then. Jim walked into my office at Virginia Tech, and began to introduce himself. I felt somewhat uncomfortable and interrupted him, saying that I knew who he was. Of course he did not know who I was and asked me what area of economics I have been working in. I replied that I was ‘an econometrician, working with actual data aiming to learn about economic phenomena of interest using statistical modeling and inference’, and I hastened to add that our two areas of expertise were rather far apart. His immediate response took me by surprise: ‘From what I know, one cannot do statistical inference unless one’s data come from random samples, which is not the case in economics’. My reply was equally surprising to him: ‘Jim, where have you been for the last 50 years?’ I went on to elaborate that he was expressing an erroneous view that was held in economics in the 1930s. We spent the rest of that afternoon educating each other about our respective areas of expertise and discussing their potential overlap. Since then, Jim and I would meet regularly [approximately once a week] over lunch or coffee to discuss a variety of current issues, including politics, economics, sports, new books, as well as the latest papers we were working on. As everybody testifies, he was extremely hard working, with new ideas and novel papers until his last days. He confessed to me that he would actually feel guilty if a week went by without producing something scholarly. We would often begin the discussion with diametrically opposed views, but eventually converge to positions with high overlap. What amazed me most about Jim was how open he was to learn about my perspective, the role of the data in testing or constraining theories, a perspective he never encountered during his illustrious career. During the last decade I helped Jim organize several very successful conferences at Virginia Tech on interdisciplinary topics covering economics, politics and philosophy of science; all related in some way to his work. He never stopped questioning his own ideas and he grew fond of my trenchant criticisms of unfounded claims, especially when my arguments were founded on actual data. As a senior academic he was amazingly supportive of younger faculty members who showed signs of scholarship. As a teacher he was an exemplar of lucidity and laconic (to the point) explanations, with every word being chosen carefully. I have seen publications describing Jim as “forbidding” and lacking “a warm personality” (*). That is not the person I got to know and admire. Jim became a regular visitor at my house, spending most holidays with my family and thoroughly enjoying the warmth of the family atmosphere. On one occasion in 2005, when he was asked by a visitor about the best restaurant in Blacksburg, he replied in all seriousness “Evie’s” and proceeded to spell it, looking at the visitor’s befuddled face. He then felt obliged to explain “that’s Aris’s house”; Evie is the name of my wife. He spent Christmas day (2012) at my house in reasonably good health and excellent spirits, fully participating in all the Greek Christmas traditions. My colleague, Deborah Mayo and her family, were also present. We will miss Jim dearly!